Fenugreek or ‘Methi’ as called in india, is a very ancient herb/plant which has a strong flavour and aroma and is used a lot, in indian cuisine in different forms! ! Its leaves and seeds are used predominantly in indian recipes, and are actually bitter in taste .It has a strong aroma, and when added to any recipe it surely titillates your taste bud. 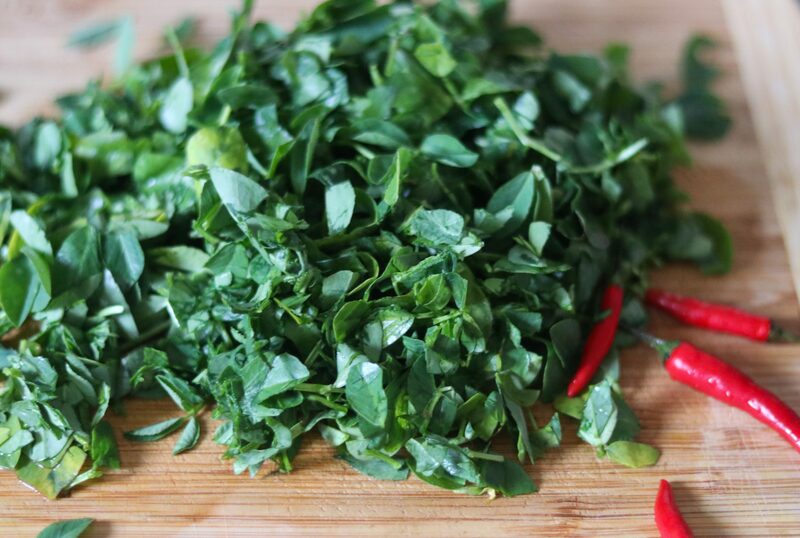 This little leaf has numerous nutritional, health and medicinal benefits ,other than a strong flavour. 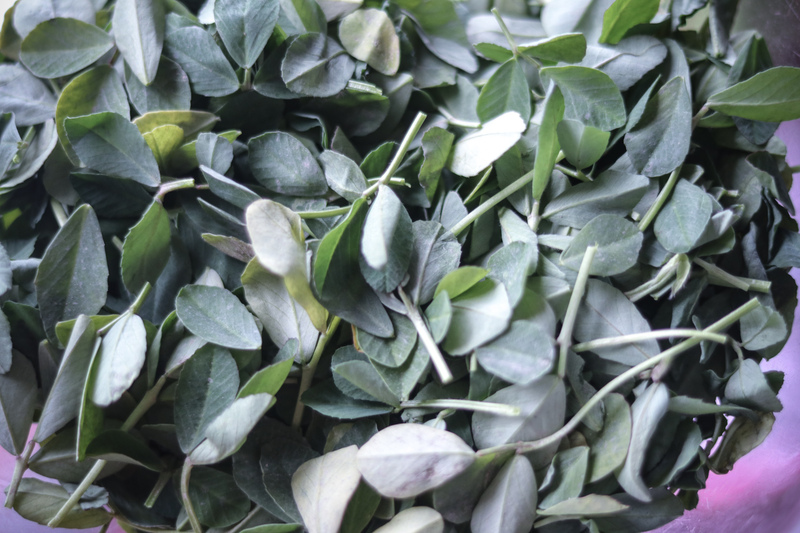 Fenugreek leaves are a natural herb which works as a nutritional supplement. Including fenugreek leaves in the diet is all you need to do to fulfill the requirements of iron and increase the red blood cells and hemoglobin. Helpful for Breast feeding mothers- Consuming fenugreek leaves/ seeds powder, helps in improving milk flow in breastfeeding mothers. And this is something that i have tried and tested myself. Yes, it does help! It is great for your skin and hair as well-Fenugreek leaves are highly beneficial in reducing blemishes and marks on the skin. People having some prominent spots or marks on skin, can try using fenugreek leaves / seeds paste .Fenugreek seeds paste works as a great hair mask. And of course if you ask about its uses in cooking, again these are a plenty. 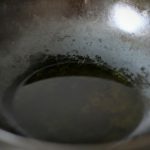 Im sure you all have heard about kasoori methi. If you read my blog, this ingredient is something that i swear by, and there are hardly any curry recipes where i do not use this magic ingredient. And of course, im not talking about any puddings here. Haha! Yes, so kasoori methi is basically dried and crushed fenugreek leaves. Adding these to your curries, and dried veggies takes the taste to another level. Also the fresh leaves, which are available in abundance in winters in india are added to the dough to make the heathiest paranthas, theplas (another version of indian flatbread), pooris, breads, and so many more curry recipes. 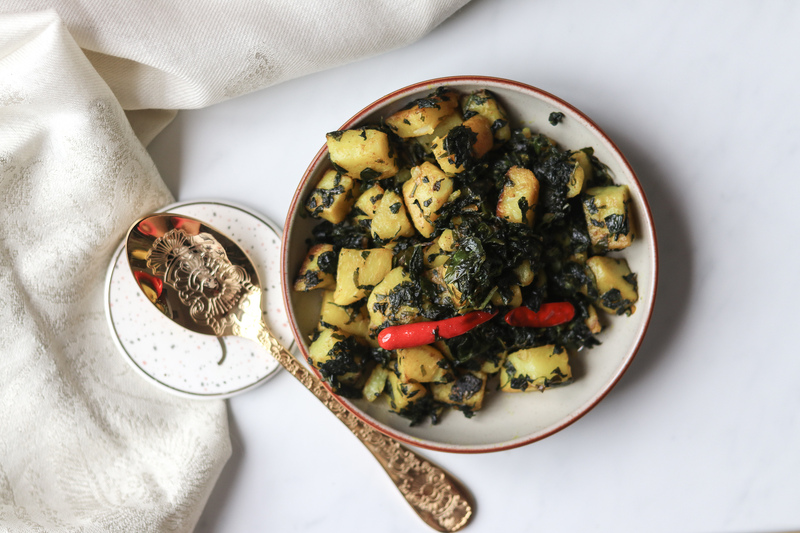 A very simple recipe using fresh fenugreek leaves, is aloo methi (sautéed potatoes and fresh fenugreek leaves), that this post is about. I know it was a long way here to the actual recipe. See, i get so involved in my writing .. i want to share everything with you ! Gosh. ive again started. OK! 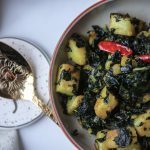 This recipe is one of the most cooked recipes in indian households in winters when methi (fenugreek leaves) are available easily in the market .It is a very warming, delicious, healthy and a quick side dish recipe . 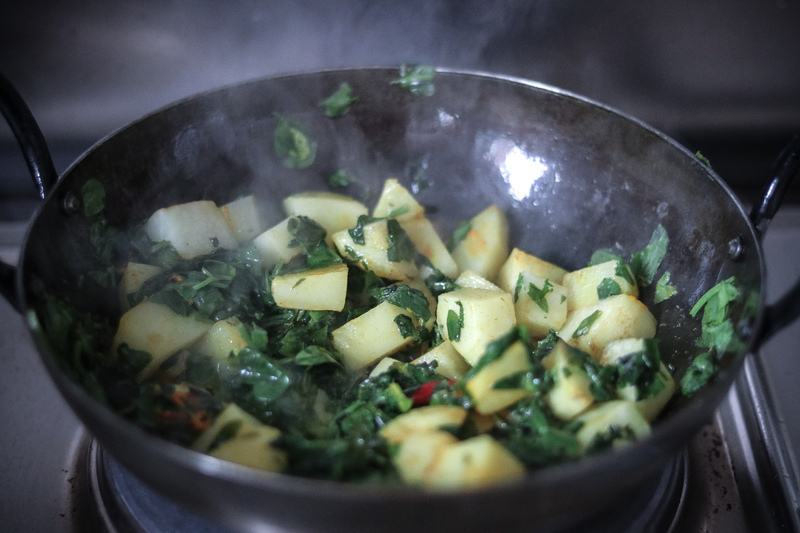 And the left over aloo methi make a great filling for sandwiches, paranthas or pita fillings, the next day. 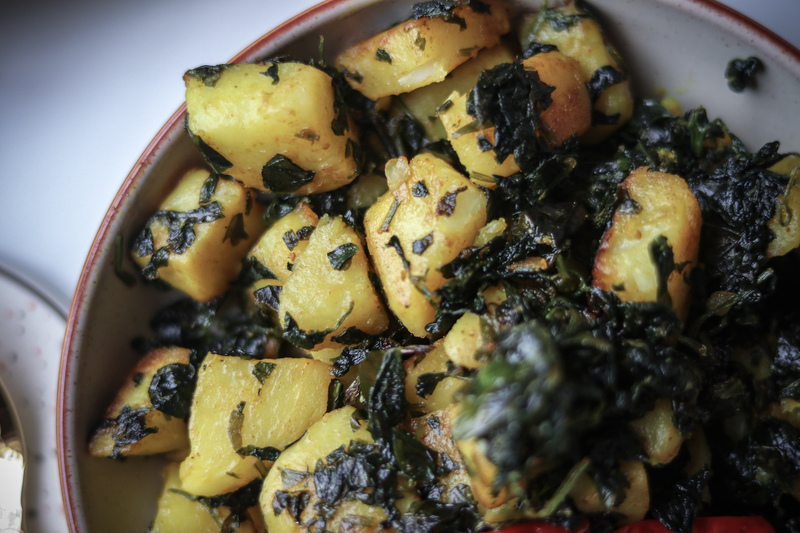 To cook aloo methi, you literally need two main basic ingredients – fresh fenugreek leaves, and potatoes. This is a no onions, no ginger garlic, and no tomatoes recipe.Other than methi leaves and potatoes, you need oil, fresh green chillies/ or red chillies (if you like), salt, red chilli powder and turmeric powder. Yes!!! thats it. And i promise this dish is full of flavour. Fenugreek leaves provide so much aroma and flavour to this dish, that adding any other spices takes over the main flavour of this dish. 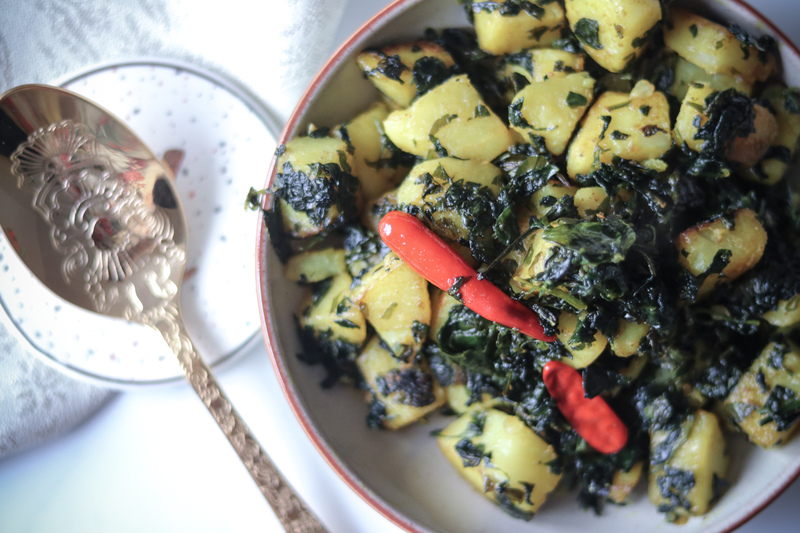 So i stick o this very simple , clean recipe when cooking aloo methi. See i tell you .. indian cooking is easy. 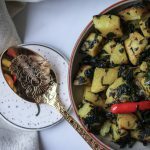 I use mustard oil to cook aloo methi, as that really imparts loads of flavour to the dish, and when i serve it hot on paranthas, or roti, i add a dollop of ghee. It tastes amazing. But if you want to use any other oil than mustard oil, you can do so. And if you are vegan, you can skip adding ghee at all. Start by cleaning the methi leaves, by separating the leaves from the stem and then washing the methi leaves (fenugreek leaves) thoroughly to remove all the soil. Wash them 5-6 times to make sure these are clean. Chop the washed fenugreek leaves roughly. 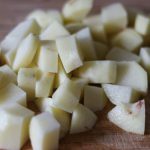 For potatoes you can use either baby potatoes (if these are really small i use these whole with skin on, and those taste the best), or you can use regular white potatoes and cut these into cubes. Heat the mustard oil till it starts smoking. Thats what i always do whenever i cook in mustard oil. 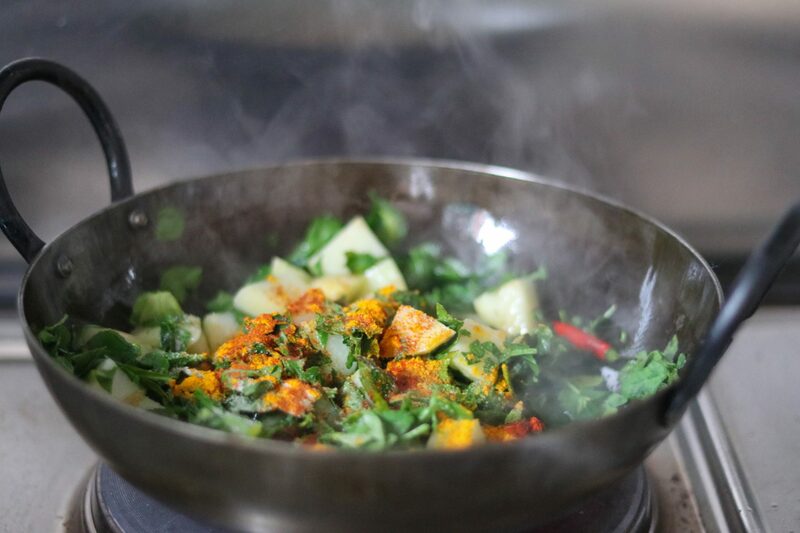 Also i prefer cooking some of the Indian dishes in an iron kadhai, because it is always a healthier thing to do.Traditionally, it is believed that cooking in iron utensils, such as a kadhai, provides health benefits. It is said that when you cook food in iron vessels, it reacts with the metal surface. As a result, iron gets released in the food. One small study confirmed that the iron content of some foods is improved when they were cooked in iron pots (when compared to food cooked in non-stick pots). Heat the mustard oil till it starts smoking. Thats what i always do whenever i cook in mustard oil. 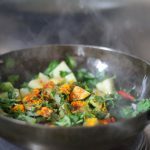 Also i prefer cooking some of the Indian dishes in an iron kadhai, because it is always a healthier thing to do.Traditionally, it is believed that cooking in iron utensils, such as a kadhai,, provides health benefits. It is said that when you cook food in iron vessels, it reacts with the metal surface. As a result, iron gets released in the food. 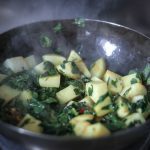 One small study confirmed that the iron content of some foods is improved when they were cooked in iron pots (when compared to food cooked in non-stick pots). 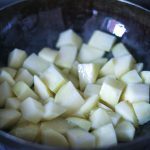 Add potatoes to oil, sauté for 2-3 minutes. 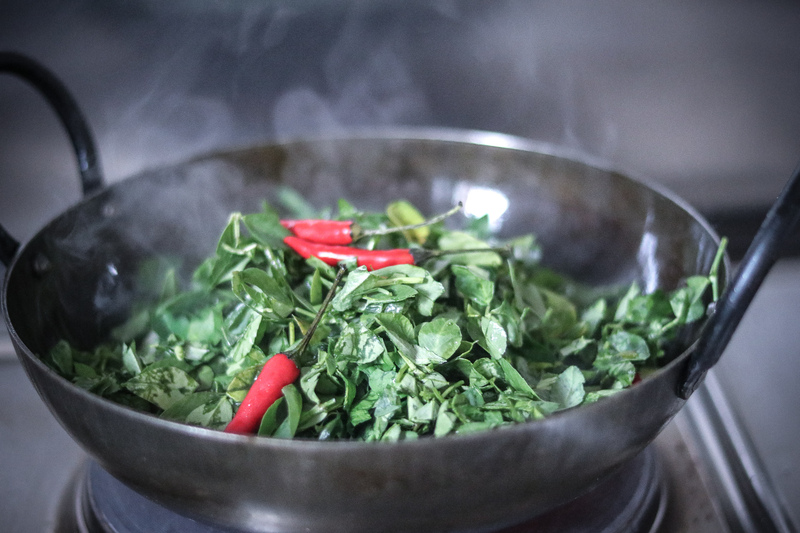 Add chopped fenugreek leaves, and chillies if you are using. mix well. Add salt, red chilli powder and turmeric powder. Mix everything. Cover and cook till potatoes are cooked. 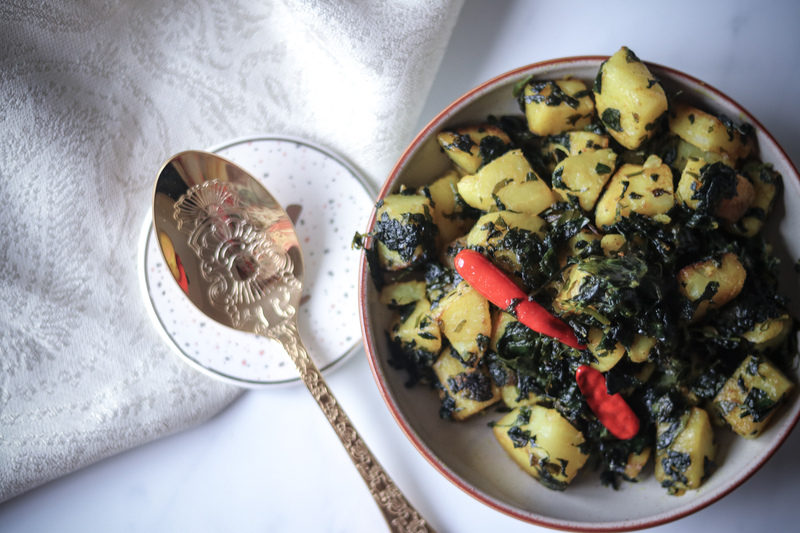 Once potatoes are done, uncover the pan and sauté it on high heat for another 5-8, mixing in between so that the potatoes don’t stick to the bottom.The potatoes are cooked, and methi leaves are nice and crispy .Your aloo methi is ready to be served. Top this on a hot roti, naan bread, or a paratha. Add a spoon of warm ghee, and serve with any curries, dahl, or on its own. It is really a hearty and warming meal on a chilli winter afternoon. Some dahl options on my blog that go really well with this side are maa rajma dahl, urad chana dahl, maa ki dahl. 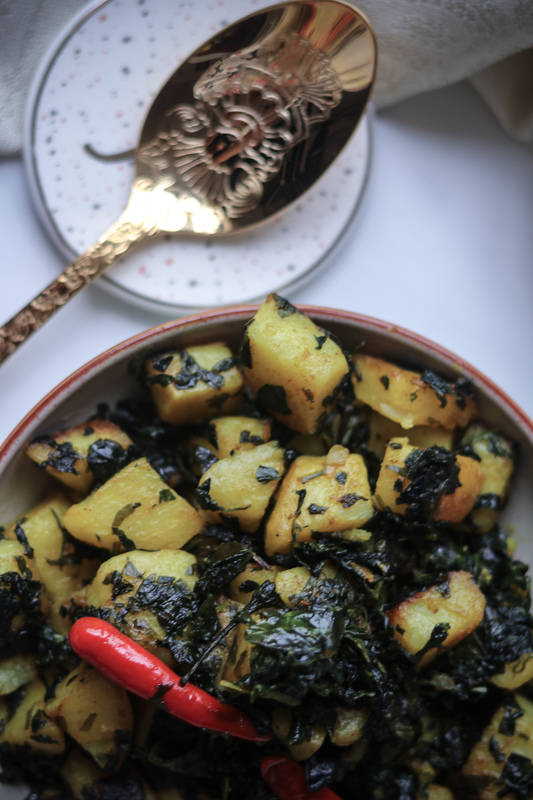 Sautéed potatoes and fenugreek leaves(aloo methi) , with minimal spices to get a perfect, flavourful indian winter veggie. 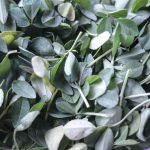 Clean the methi leaves, by separating the leaves from the stem and then washing the methi leaves (fenugreek leaves) thoroughly to remove all the soil. Wash them 5-6 times to make sure these are clean. Chop the washed fenugreek leaves roughly. If using baby potatoes and if these are really small , you can use these whole with skin on, and those taste the best. 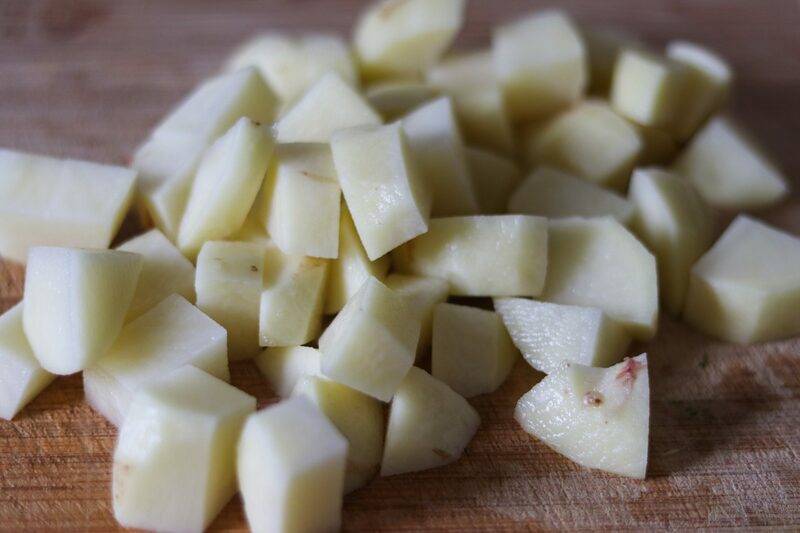 If you are using regular white potatoes , then wash ,peel and cut these into cubes. Add potatoes, sauté for 2-3 minutes. Add chopped fenugreek leaves. mix well. Add salt, red chilli powder and turmeric powder. Mix everything. Cover and cook till potatoes are cooked. 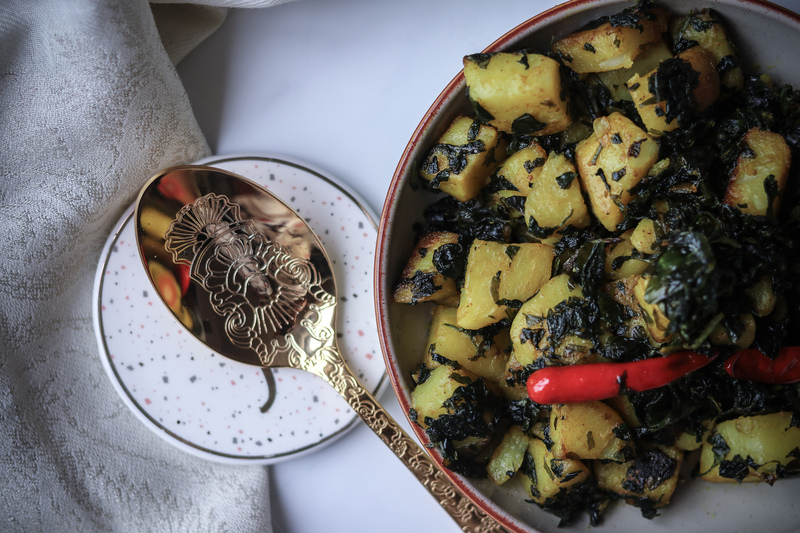 Once potatoes are done, uncover the pan and sauté it on high heat for another 5-8, mixing in between so that the potatoes don’t stick to the bottom.The potatoes are cooked, and methi leaves are nice and crispy .Your aloo methi is ready to be served. 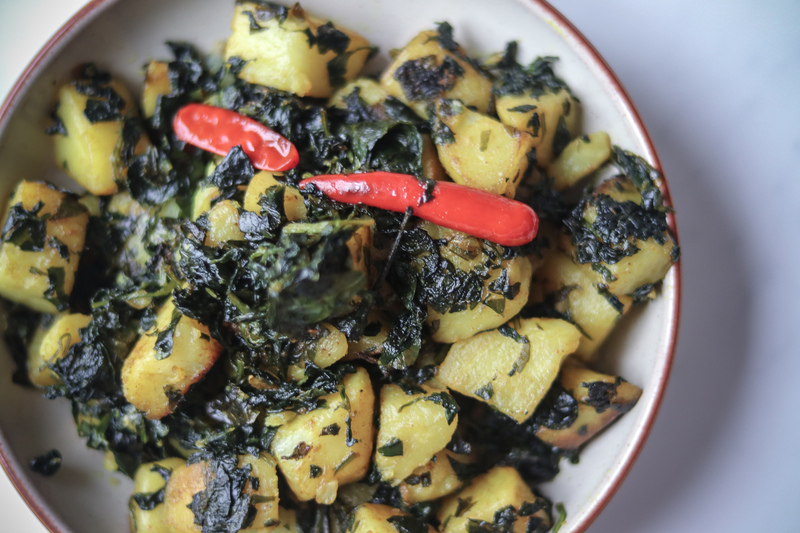 Left over aloo methi make a great filling for sandwiches, paranthas or pita fillings. If fresh fenugreek leaves (methi) is not available, you can make the recipe using kasoori methi (dried methi leaves). 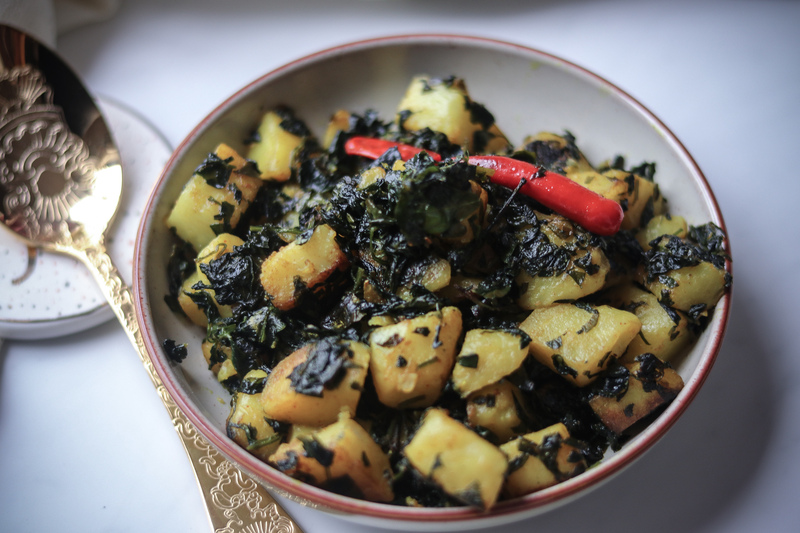 To make aloo methi using dried fenugreek leaves- soak about 300-400gms of the dried fenugreek leaves in water for about 20-30 minutes till these are soft ,seive them and then use in the recipe, in-place of fresh fenugreek leaves.